While I have my own line of merchandise that I like to wear and/or use, I do get asked for these Gone Squatchin’ trucker hats kind of a lot. The above link leads you to an outside site where these can be purchased, and according to the link, one size fits all. If they can make Bobo look suave and debonair, why not you? My field notes from the Finding Bigfoot episode where we pit Oregon against Washington for the title of the “Squatchiest State” have now been published. Read the article to learn about what went on behind the scenes, and also to see never-before-seen photographs from the shoot. 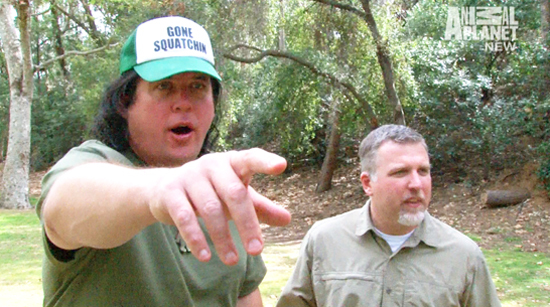 Finding Bigfoot returned to West Virginia for a second time in late 2013. The expedition was a success, and the team walked away with several interviews with credible witnesses and a recording of what seems to be a sasquatch near the New River Gorge. My field notes include details not found in the episode, photographs of the locations of sightings, and the audio file from my own recorder on the night we got vocalizations. My field notes for the Finding Bigfoot expedition to Michigan’s Upper Peninsula have now been published. The field notes include other photos from the site, as well as an in-depth discussion on a possible cause of bigfoot eyeshine.